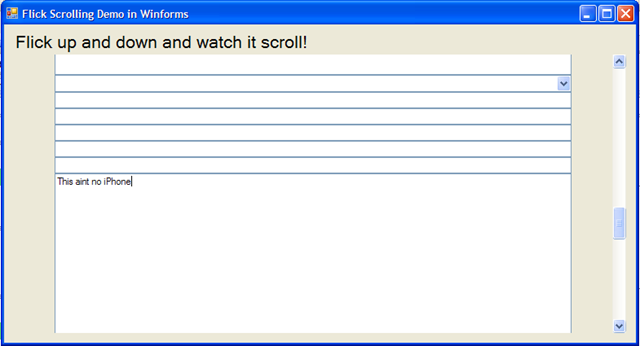 In the article A Simple Scroll Controller for Winforms I mentioned that I was working on a FlickScrolling framework for Winforms. I finished a version of this code a couple of months ago and it seems to work well. The code never went into production because I think that Windows 7 will provide this functionality automatically for winforms applications. Nevertheless, some people have showed an interest in what I came up with, so I’m posting it here for your edification. I hope someone finds it useful. To use, simply instantiate the “ApplicationFlickScrolling” class, passing in the datatypes of the container controls you wish to scroll. 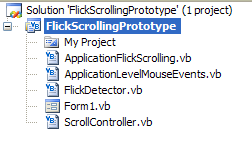 If I’d have continued developing this I would have modified ScrollController to use “proper” easing functions. Note: The usual disclaimers apply for this code, which has been given freely to help others learn and is not intended for usage in your business application or for running a nuclear facility. I’ve been looking for that kind of code for quite a while ! Seems really interesting, but apparently, the downloading link is dead… Could you put it up again ? I’ve moved the code to a more reliable source and changed the link. I’ve played a bit with it this morning, i’m trying to implement it to be able to scroll a datagridview. I tried puting the dgv in a panel, which worked fine, but it’s not fast enough (it’s a huuuge datagridview) plus it’s messing with some of my other functions. I’ve been struggling a bit with the looks of the radlistbox though. as soon as i have that setup, I hope the scrolling will go smooth.